The currency markets are the largest and most actively traded markets in the world with $5,100,000,000,000 worth of trading each day. That’s trillion with a capital “T”. With foreign exchange being used by institutions large and small in the most liquid markets in the world, it makes sense to pay attention to them for clues. These markets are impacted by the same forces of supply and demand as any other market, like stocks, bonds, and commodities. Each transaction in the currency market involves two different trades: the sale of one currency and the purchase of another. The two currencies involved in the trade are known as a pair. While it’s possible to quote a price in any currency pair, in the interbank market (which is the ultimate generator of foreign exchange liquidity) most currencies are only tradable against a small number of other currencies – most commonly the U.S. Dollar. There are eight major pairs. As shown below, the three biggest currencies responsible for most of the volume are the U.S. Dollar, European Union Euro, and Japanese Yen. We’re going to focus on those. In addition, we’re going to see what’s going on with one of the exotic currencies, the Mexican Peso. All three of the pairs under review will involve the U.S. Dollar, the world’s “hub” and reserve currency. First, let’s start with the largest pair, U.S. Dollar / Euro (USD:EUR). Here’s a weekly chart of the pair going back 10 years. Right away, we can see the U.S. Dollar’s strong rally against the Euro in 2014. Since the beginning of 2015, however, the pair has been locked in a range with equal buying and selling pressure. Earlier this year, it appeared the Dollar was on the verge of breaking out again, but sellers stepped in and drove it back down in what could be a false move. From false moves come fast moves in the opposite direction. The USD:EUR still has a series of higher lows in place. That would change with a close below 0.92 and cause a breach of the upward trendline (annotated in green). Such a move could see the Dollar weaken to the point of revisiting a prior area of support near 0.87. Next up, the U.S. Dollar / Japanese Yen (USD:JPY) looking back 10 years. After a strong rally from mid-2016 through early 2017, the Dollar has stalled and moved lower after kissing the upper trend green trend line. After establishing another in a series of lower highs, the USD:JPY is at a major level of support near 111. A sustained break below 110 could trigger further Dollar weakness down to 100, a major level of supply and demand over the past decade. Finally, the U.S Dollar / Mexican Peso (USD:MXN). Not one of the main currency crosses, but insightful nonetheless. Here we have the world’s reserve currency potentially breaking down versus a historical weak currency. That’s notable. Since early 2015, the U.S. Dollar has been ripping versus the Peso. However, the U.S. Dollar peaked in early 2017 and has reversed down just as it did against the aforementioned major pairs. Across the currency spectrum, since January 1st, we’re seeing the Dollar weaken. See below. A picture is worth a thousand words. Since the beginning of 2017, the Almighty Dollar has been weakening against almost the entire currency complex. So what’s the big deal? Well, since much our world (including stocks, commodities, goods, and services) is priced in Dollars, this development could provide some significant opportunities in many different asset classes. What specifically? That’s for another post. What do we know for sure? Price knows more than we do. 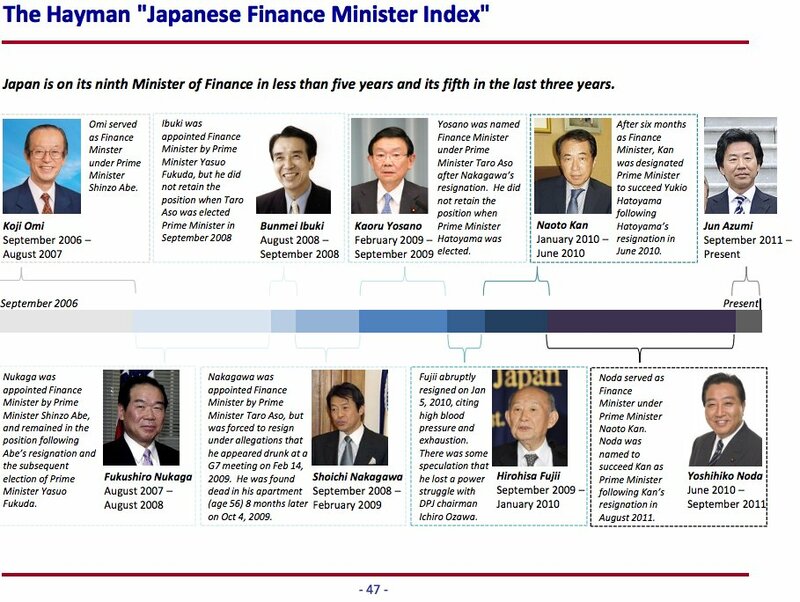 The fact that Japan is on its 12th Finance Minister in the past 10 years should give you an idea of how difficult it’s been to manage their country’s currency during an ongoing deflationary cycle that started 25 years ago. For reference, the Federal Reserve has had two chairs during past 10 years: Ben Bernanke & Janet Yellen. 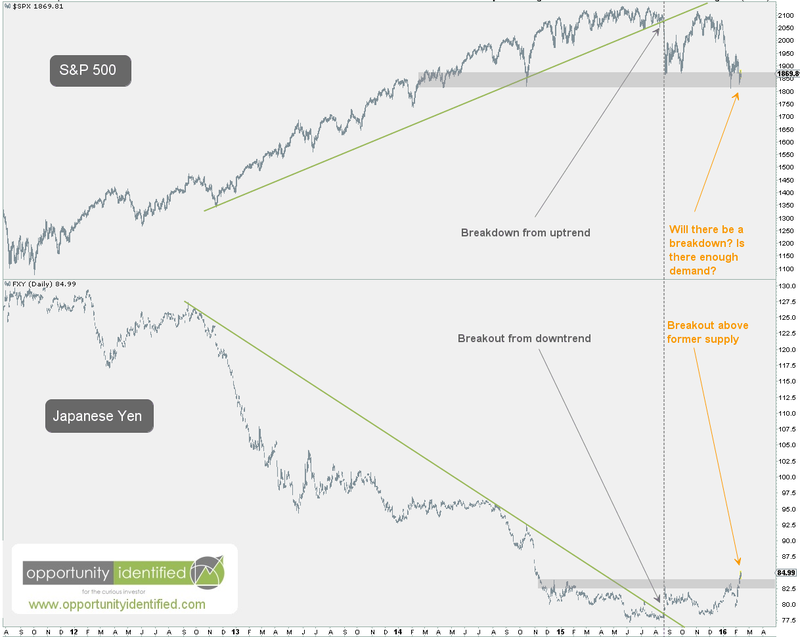 For many years now, the correlation between the yen and S&P 500 has been -0.9 to -1.0. Meaning, whichever direction one goes, the other goes equally the other direction. So as investors, we should definitely care which direction the yen is heading. If it is dropping in value, that is a positive for the S&P 500 while an increase in yen value means trouble for the S&P 500. We can see that two days ago, the Yen broke out over an area of supply that’s been in place since late 2014. In the past, buyers had stepped in near the 82-83 price level. But a little over 48 hours ago, this changed. Demand for Yen has driven its price to new 52-week highs. Correspondingly, U.S. stocks (represented by the S&P 500 in the top pane) have held up so far, holding near previous areas of demand (shaded gray area). If the Yen continues upward, we expect U.S. stocks to resume their descent. Nothing is guaranteed and as investors and market participants, we must not marry our opinions and keep an open mind. We only care about price. It’s still possible for buyers to step in at this level and save U.S. stocks from further downward pressure. If that takes place, we expect the Yen to rapidly reverse course. We’ll make sure to provide updates to this scenario as it unfolds, with price targets for both the Yen and U.S. equities.